I am a little obsessed with granola, I know. This is third granola recipe I've posted here (see the others here and here). But I eat a lot of yogurt and like to add granola to make it a filling breakfast. Unfortunately, most granola you buy at the grocery store has a lot of sugar in it and that defeats the purpose of eating it in the first place. Preheat oven to 300 degrees. Line a sheet pan with parchment paper (or coat pan with cooking spray). In a large bowl add oats, nuts, seeds (except chia seeds) and spices. Stir together well. 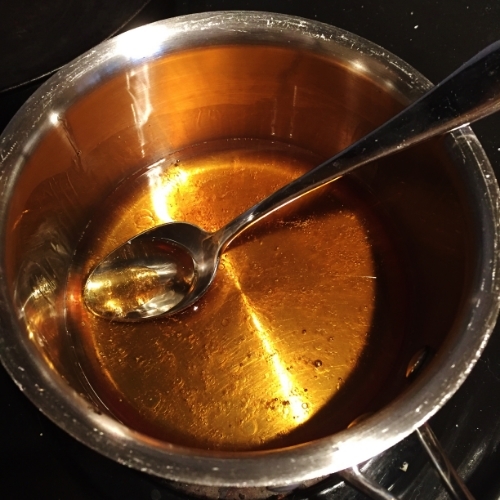 In a small saucepan, heat the coconut oil, honey and vanilla over low heat. Stir until completely melted and combined. Pour liquid over dry ingredients and stir well until everything is coated. Spread evenly on sheet pan. Bake at 300 for 40 minutes, stirring every 10-15 minutes. After 40 minutes pull out pan and turn off the oven. Add the dried cherries and chia seeds to the granola and add back to the warm oven for 10 minutes. Set hot pan on wire rack and cool for at least 30 minutes. Granola will firm up as it cools. Once completely cool, break up pieces and store in airtight container. Serve over yogurt, with milk or just plain as a snack!